The temperature Variation of Conductivity and Carrier Concentration. Temperature causes electrons to be promotedto the conduction band and from donor levels, or holes to acceptor levels.The dependence of conductivity on temperature is like other thermally activated processes: σ =σ0 exp (-Е/2kТ), where A is a constant (the mobility varies much more slowly with temperature). Extrinsic semiconductors have, in addition to this dependence, one due to the thermal promotion of electrons from donor levels or holes from acceptor levels. The dependence on temperature is also exponential but it eventually saturates at high temperatures where all the donors are emptied or all the acceptors are filled. This means that at low temperatures, extrinsic semiconductors have larger conductivity than intrinsic semiconductors. At high temperatures, both the impurity levels and valence electrons are ionized, but since the impurities are very low in number and they are exhausted, eventually the behavior is dominated by the intrinsic type of conductivity. Fig.17.5. Energy band structure of an n-type semi-conductor. 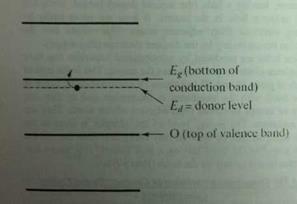 The extra electron from the group VA dopant produces a donor level (Ed) near the conduction band. This provides relatively easy production of conduction electrons. fig. 17.6 Schematic of the production of a conduction electron in an n-type semiconductor, (a) The extra electron associated with the group VA atom can lb) еая1у break away, becoming a conduction electron and leaving behind an empty donor state associated with the impurity atom. 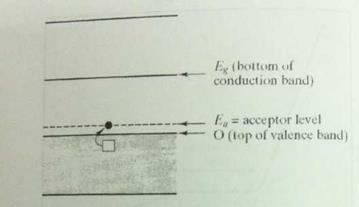 where Eg is acceptor level from Fig. 17.8. Fig. 17.8 shows the Arrhenius plot of Inσ versus 1/T for a p-type material. It is quite similar to Fig. 17.8 for n-type. The plateau in conductivity between the extrinsic and intrinsic regions is termed the saturation range for p-type behavior rather than exhaustion range. 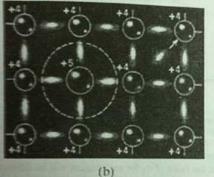 Saturation occurs when all acceptors levels (= number of group III A atoms) have become occupiedwith electrons. Fig. 17.9. 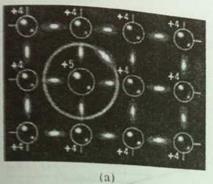 Energy band structure of a p-type semiconductor. The deficiency of valence electrons in the group ША dopant produces an acceptor level (Ea) near the valence band. Electron holes are produced as a result of thermal promotion over this relatively small energy barrier.